Because tradition is so important at Cunard, to learn about the company’s traditions, Captain Oprey has turned to people such as Stephen Payne, the naval architect who designed QM2 and John Duffy, the legendary hotel manager who served on the original Queen Elizabeth, was synonymous with the Queen Elizabeth 2 and who recently retired from QM2. Third, “she is in the public eye all of the time.” Because she is the heir to the Cunard tradition and the heritage of the great transatlantic ocean liners, QM2 has a unique public reputation that extends beyond the cruise ship industry. In addition, her participation in public events such as the Queen’s Diamond Jubilee celebrations places her in the spotlight more than other passenger ships. However, one of the traditions that has enabled Cunard to survive for more than 170 years is the ability to reconcile respect for the past with the ability to adapt to the demands of contemporary life. The best illustration of this is the life of QE2, which continuously evolved over the course of her 40 years in service. Some changes are forced upon the ship by external forces. For example, historically, the shipping companies emphasized speed and vied to have the fastest ocean liner on the Atlantic While QM2 remains faster than any liner or cruise ship in service today, the high cost of fuel keeps her from using her speed except on rare occasions. This is because there is much greater fuel consumption at higher speeds. As captain, Oprey is responsible for the efficient operation of the ship on a day-to-day basis. This involves providing leadership to over a thousand crew members. 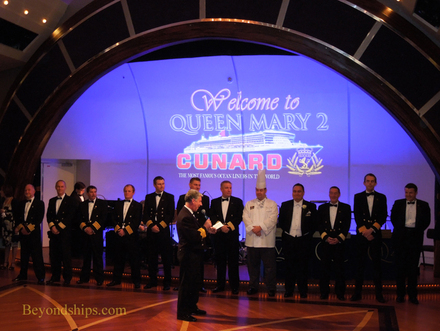 Captain Oprey introducing the senior officers during a reception on Queen Mary 2. "I like to be out and be seen. I think that is another part to your role. I’m always ready to stop and have a chat. If you are not prepared to do that then don’t bother coming, go and work on a cargo ship."